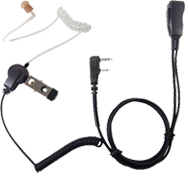 2-WIRE SPM-2000 Series- Surveillance Kit with Unique Belt-Mounted PTT Junction Box and surveillance style microphone/PTT with Coiled Cable. 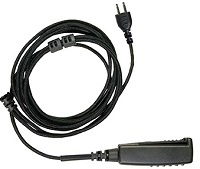 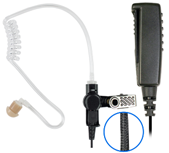 NEW BRAIDED FIBER 2-WIRE KIT-Surveillance Kit with noise reduction mic on separate cables allow mic & PTT to be conveniently and discreetly located. 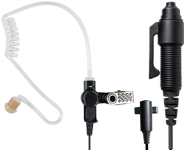 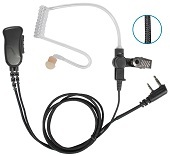 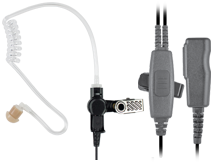 NEW BRAIDED FIBER MIRAGE™ Series Surveillance Kit, Lapel Mic Style (1-wire) with noise reducing mic element and clear tube earphone.